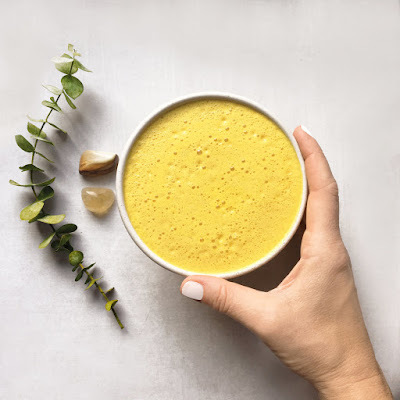 Sunshine Tumeric Latte- Hello everybody, welcome back with ZetiraKitchen! Today i will share about How to Make Creamy Sunshine Tumeric Latte. For coffee enthusiasts must try this one latte. Latte with a sweet taste and rich in spices makes this latte different from most lattes. With the existence of these spices, besides having a delicious taste, this latte is rich in benefits like it's great for your skin because it has anti-inflammatory properties mean it can help to reduce redness and skin irritation. With its blend of silky smooth sunflower seeds and coconut milk, a spicy intoxicating medley of turmeric, ginger, cinnamon, cardamom, vanilla, and black pepper, and a dash of natural sweetness from dates, makes this latte so perfectly. You can made easly at home, just prepare the ingredients and played with your kitchen tools. So let's play now! Pour sunflower seeds and desiccated coconut with coconut soaking water into high-speed blender with the three cups of water. Blend until the mixture is completely smooth and creamy, then pour into a nut milk bag over a large bowl. To clean the blender using fourth cup of water , then add this water to the nut milk bag too. Squeezee the nut milk bag gently until all the liquid is extracted and just left with a dry pulp. Place the pulp into a sealed container in the freezer. Pour your finished milk back into the blender with another ingredients, and blend on high until smooth. Your Sunshine Tumeric Latte ready to serve. Add some cube ice for a more good tasty.